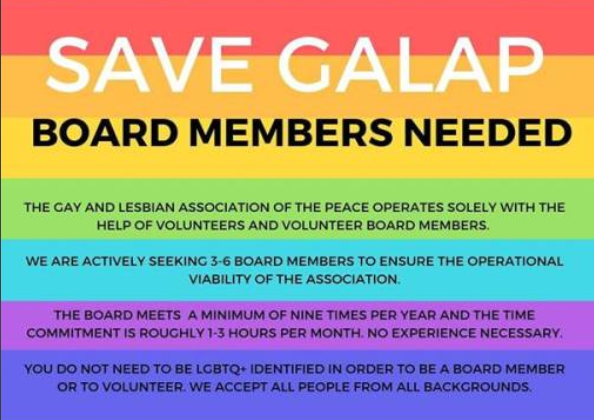 The Gay and Lesbian Association of the Peace has put out a plea for volunteers and board members. Director Chancie Cook says if they don’t find more people to join, the group may not be able to continue. GALAP has run in Grande Prairie for over ten years. It aims to increase the quality of life for everyone through a better understanding of sexual diversity. It is a 100% volunteer-based non-profit group. Cook says they are looking for 3 to 5 members, regardless of gender, race or sexual orientation who can commit to attending a once a month meeting. GALAP takes part in three major events during the year including the pride flag raising at City Hall, the Pride Pancake Breakfast and the Canada Day Parade. Cook says it’s important to find more volunteers so that they can continue to be a part of the community. Anyone interested in volunteering or finding out more can contact Cook at 780-978-1000. People can also attend the groups Annual General Meeting on April 17th. It will be held at The Community Village, Building C, north entrance doors at 7 p.m.